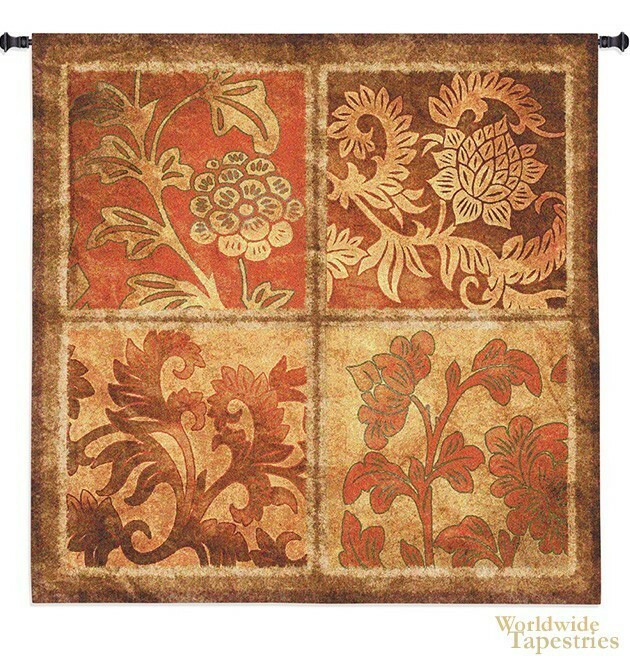 This tapestry "Botanical Scroll" shows a design of four botanical tiles in rustic tones. Based on the ancient works of art and print making where floral elements were used to create murals which resembled the wallpaper of today, this tapestry shows four different designs to create a cohesive work. The use of color is harmonious as the rustic tones of reds, browns and sand complement each other as does the variation in the botanical designs. A rustic, parchment feel is also created by the gradations in color. This tapestry "Botanical Scroll" is backed with a lining and has a tunnel for easy hanging. Note: tapestry rod and tassels, where pictured, are purchased separately. Dimensions: W 44" x H 44"